Participating in ICO can bring massive returns, however the venture is risky too. There are many things that can go wrong, and unfortunately, you may end up losing all your investments. This is why it is crucial to prepare yourself and do your due diligence before investing. 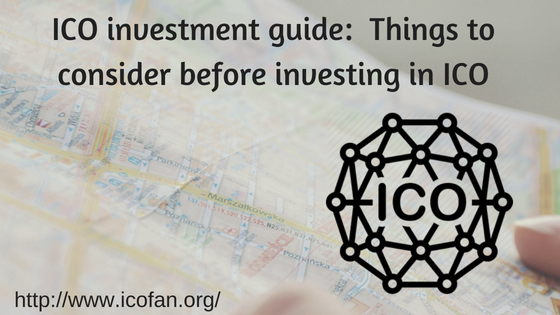 This ICO investment guide covers the things that you should consider prior to investing in any ICO token sale. Read complete information about the ICO project on its website. Check out the details of the company - the team and the advisors, the problem that they are solving, the market size of the industry, the revenue model and how feasible is the solution that the company is offering. In addition, check the legal INC formulation of the company and from where ICO token sale is being offered. Find out if the ICO project is backed by any VC or Angel investor; make sure to check the investor’s profile and experience too. A well established and experienced investor means that the project has more chances of being successful. However, this does not guarantee success. Read the white paper; it contains detailed information about the project and ICO phases. If the white paper is too technical for you, seek advice of an expert. Check the utility of the token. Find out the value of a single token along with where and how can it be used other than trading. A careful evaluation of ICO terms and conditions is important. Find out if there has been a large pre-sale discount. If yes, then at what stage. What are ICO dates and discount offers? Also, examine that the total market cap and funds being collected are reasonable or not. An important thing to remember before investing in any ICO project is that most ICO stages are only on paper known as “White paper” or at an early development stage. Furthermore, 99% ICO projects are working on Blockchain, which is a new technology and the professionals are rapidly honing their Blockchain development skills, which means that a project may get delayed. Also, there would not be a tenfold increase in the value of all ICO-issued tokens, and in the worst case some tokens may even fail and no longer stay on the cryptocurrency market. In addition to the points mentioned above in this ICO investment guide, one of the most important things to remember is - never invest more than you are prepared to lose. Do not make the mistake of investing all your savings just because you think it will make you big bucks. ICO can make you rich but it can also make you lose all your money, so be careful. To choose the right ICO project for investment, stay informed about all of the ICO projects on the market. You can subscribe to a newsletter to get regular ICO alert and know what’s happening in the cryptocurrency world. Embracing the revolutionary concept of Blockchain powered Fintech solutions, Coinnup is ready to launch a mobile app that will provide Fintech solutions at your fingertips and take monetary transactions to a new level. The app will include all the core features, such as Mobile Recharge, a Universal Wallet, Crypto Exchange and Cryptocurrency trading. Coinnup’s all-in-one application facilitates cryptocurrency trading. The users simply need to donwload and install the application, and perform diverse tasks like exchanging cryptocurrencies, sending money or paying bills. In addition, a user can also buy groceries with just a few taps. Coinnup was launched with an aim to provide people with an advanced platform for cryptocurrency trading. The Coinnup mobile app will have a Universal Wallet for storing multiple currencies. Users can retrieve and use coins according to their needs, without any hassle. The light architecture of the wallet allows smooth transactions and super-fast operations. The use of public and private keys enhances the security of the wallet, making it highly-secure. The integration of the Paymaz exchange in the App eliminates the need to exchange the coins before a transaction. 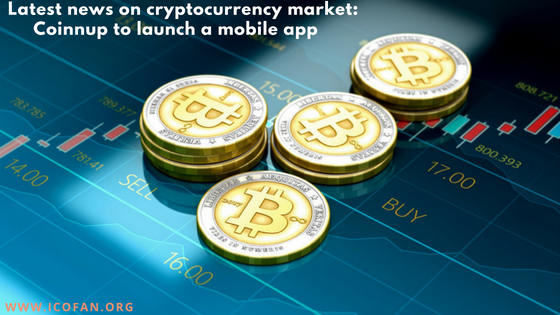 Thanks to Coinnup App, cryptocurrency trading will not be a lengthy process any more. According to the latest news on cryptocurrency market, the App will cut down the cost by around 70%. The App will also empower the users to make easy fund withdrawals anytime, anywhere. All this makes Coinnup App a more convenient option compared to other traditional Fintech solutions. Mobile recharge is what most people look for. Coinnup’s Paymaz platform provides an option to recharge a mobile, send mobile credit to others and make transactions using cryptocurrency or fiat currency. One of the most important features that the app will provide to its users is exchanging cryptocurrencies with minimum transaction fees to provide the best deals to the users. The app provides instant processing and the most secure architecture with the lowest trading fees. When a single app offers so many features, the users are sure to welcome it with great enthusiasm. Coinnup will hopefully turn out to be one of the best platforms for blockchain based Fintech solutions and to accept the digital tokens and cryptocurrencies.